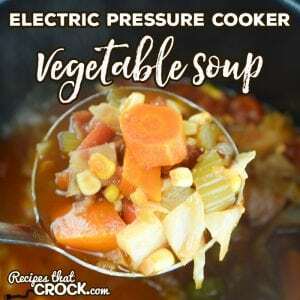 Electric Pressure Cooker Vegetable Soup (Easy Instant Pot Recipe) - Recipes That Crock! Are you looking for an easy instant pot recipe? 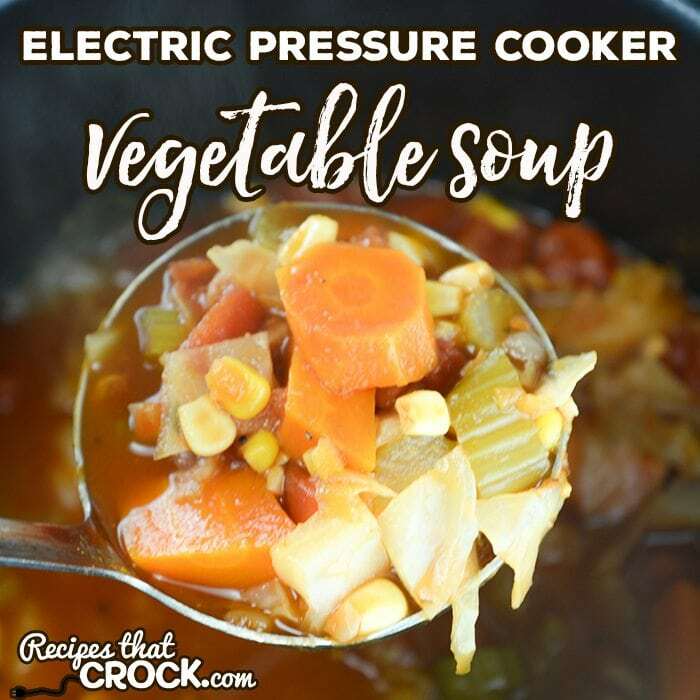 Our Electric Pressure Cooker Vegetable Soup takes our tried and true Crock Pot All Day Veggie Soup and converts it into an easy instant pot recipe that is ready in under an hour! Cris here. I get asked a lot if we can add more easy instant pot recipes and while we do have a few here, we are adding them slowly to the site. Why slowly? Well first and foremost we want to really give any recipe a good (or Goode- ha!) test before we put it on the site– just like we do with all our slow cooker recipes. But I also want to make sure that for every electric pressure cooker recipe we share we have a matching slow cooker version for our readers that do not have an instant pot since this is a slow cooker recipe site ;). 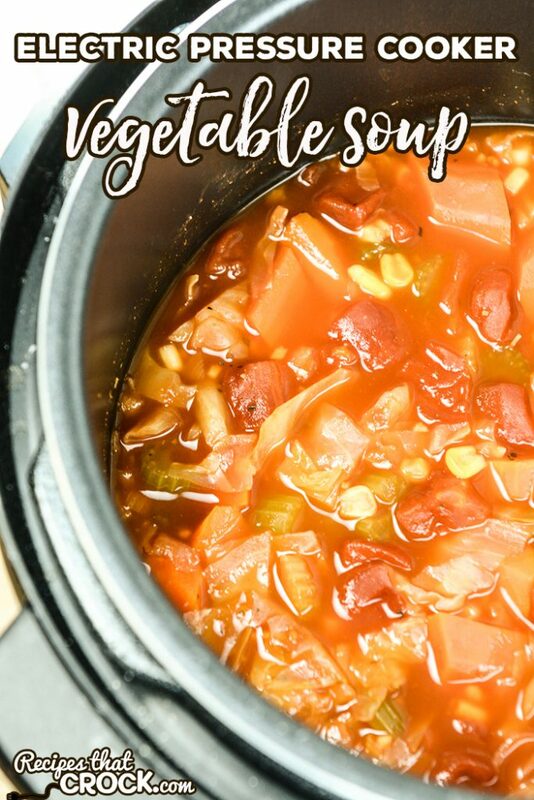 So if you don’t have an electric pressure cooker, here is our crock pot veggie soup. It is just a wee bit different but a tried and true veggie soup in the slow cooker none-the-less! 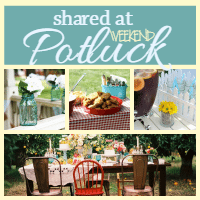 Note: Scroll to the bottom of the post for a printable version of the recipe. Place all ingredients in your 6 quart electric pressure cooker and stir well. Put lid on the unit and set the release knob to seal. Using the soup setting, set your unit to cook for 25 min with the warming feature turned off. After unit reaches pressure, cooks under pressure for 25 min and shuts off, use quick release to release pressure. This is NOT a slow cooker recipe. 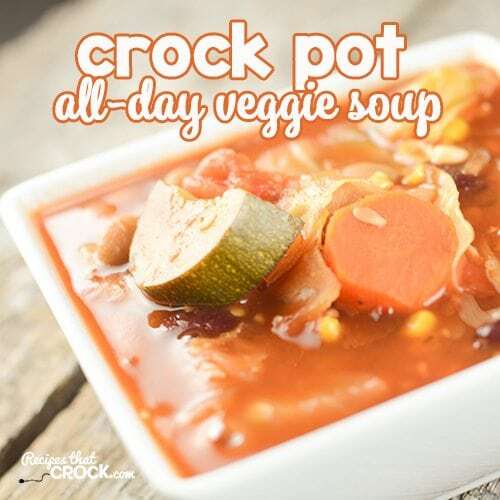 If you are looking for a crock pot version, we love this Slow Cooker All Day Veggie Soup. We used our Farberware Electric Pressure Cooker to make this soup (and we have used our Instant Pot as well). Note that we used a 6 quart pressure cooker. We used steak seasoning instead of salt and pepper to give a little boost of flavor to the soup. Cooking times are always a basic guideline and dependent on your cooking unit. Made the Pressure Cooker version last night. It was excellent! I tweaked it slightly by pressure cooking two pounds of cubed and seasoned roast for 25 minutes and then used those juices (and of course the beef) instead of the broth. It was perfect consistency and flavor. Please keep adding pressure cooker recipes. Thanks for a Great Soup recipe!! I made it this morning. Couple of changes because of the MSG allergy that I have. I used Hunts – because their products have no MSG in them; also neither do the Better than Bouillon products which I used as the 2 coups of Beef Base. I also added 2 Tablespoons of Mrs. Dash Original seasoning – just for a little more flavor. The Montreal Steak Seasoning is a terrific idea and I love it in place of the salt. The other thing I did was I pureed the entire batch of soup – it’s going to be 90 degrees here in Sacramento, CA today – little hot for soup for dinner – but I think this is a great breakfast drink in the morning to get you going. And because I pureed it I changed the corn to broccoli and added string beans.